Photograph by Eli Pousson, 2015 February 19. The former St. Vincent’s Infant Asylum/Carver Hall Apartments buildings is a complex of structures built between 1860 and the 1910s to provide housing and medical services to dependent children and women, along with housing for the nuns who operated the facility. After years of declining use, the Infant Asylum left the facility around 1934 for a new location on Reisterstown Road. Around 1941, the building was converted to use as Carver Hall Apartments offering a range of rental units to a largely African American group of tenants from the up through 2013. Since the 1970s, the management of the property has posed significant challenges for residents in the building with a major fire in 1978, a lawsuit in 1993 and issues with drug traffic and violence at the building in the 1900s. In January 2015, the building caught on fire destroying the roof and gutting much of the interior. It now stands vacant. 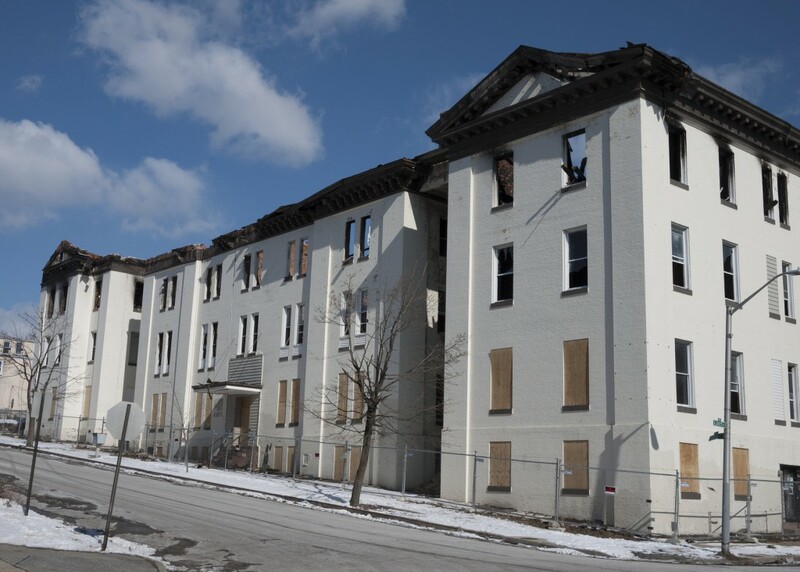 Despite the fire damage, the former Carver Hall Apartments continues to represent an important landmark reflecting Baltimore’s legacy of philanthropy, nationally significant Catholic history, and the history of African-American housing during the mid-20th century. Given the proximity of the building to the Upton Metro Station and the planned State Center development project, we believe the existing building can be turned from a vacant shell into a neighborhood asset through reuse and rehabilitation. The partnership of Long and Powell included architects Louis L. Long and George Thomas Powell. The “Powell” in this partnership is often attributed to be Samuel Powell (also known as S. Robinson Powell) but historian Jimmy Counts located an advertisement published in The Metropolitan Catholic Almanac (1859) that identified George T. Powell as the partner. According to architectural historian James T. Wollon, Louis L. Long practiced architecture in Baltimore for about eight years (1853-1860) leaving a legacy of around thirty buildings. Long’s best-known work in Baltimore are the St. Ignatius Church and Loyola College buildings (1853-56) located on Calvert Street at Madison Street. Born in May 1837 near Ellicott’s Mills, Maryland, George T. Powell was likely mentored by his older brother Walter Angelo Powell (born January 1829) who worked with Robert Mills. According to Counts, Long & Powell ended their partnership around 1860. Long moved to St. Joseph, Missouri later that year and he appears in the 1861 St. Joseph City Directory. George continued to practice in Baltimore. St. Vincents grew throughout the late 1800s, with an average of 50 to 60 young children admitted annually between 1856 and 1867. This matched the growth nationally of institutional care for dependent children in the 19th century. The population of children in orphanages in the United States increased from only around 200 in 1790 to about 123,000 in 1910. From 1778 to 1856, twelve orphanages were founded in Baltimore, seven Protestant and six Catholic. Almost twice as many institutions were established between 1860 and 1910 and, by 1910, Baltimore had a total of 28 orphanages. In the late 19th century Baltimore as a whole was served by three large non-denominational orphanages, with 112 to 150 children each, five orphan asylums “under Roman Catholic management,” three Protestant orphanages for African-Americans, eight denominational or religious orphanages, and five local orphanages throughout the state. Jewish orphanages included the Hebrew Orphan Asylum (1872), the Hebrew Children Sheltering and Protective Association, also known as the Betsy Levy Memorial Home (1900-1921), and the Daughters of Hanna (1913). Other orphanages and religious homes for children in the late 19th century included the St. Mary’s Industrial School, St. Elizabeth’s for African American infants, the Samuel Ready School, and the Dolan House. This rapid growth also fit within a child welfare movement that took shape in the late 19th and early 20th century, exemplified by the institution of a compulsory education law (1901), new child labor laws that raised the age of eligibility for employment to fourteen (1902), a juvenile court system (1902), and a playground movement (1898). In 1888, the Daughters of Charity acquired a new property at 6700 Reisterstown Road to provide a “country home” for the children during the summer months. The institution continued to operate its original building in the winters until In 1934, when it sold their original building at Lafayette and Division Streets and moved nearly all of their operations to the property on Reisterstown Road. The building was converted into apartments around 1941 and rented largely to African Americans tenants who suffered from a severe shortage of rental housing in Baltimore during the 1940s and 1950s. Alfred Tibbs, a 33-year-old shoemaker, who lived at the apartment building in 1942 when he was convicted of shooting his estranged wife’s fiancé Donald “Frenchie” White, owner of the De Luxe Five and Ten at 1322 Pennsylvania Avenue. Mrs. William Wells, who lived at the building in 1943 when her son Charles Law Wells was reported missing in the Pacific as part of the crew of the Runner submarine. AFRO linotype operator Joseph Francis, who lived at the building in 1944 when he received a divorce from his wife. Jesse Snead and Mrs. Dorothy C. Snead, whose daughter Shirley Evelyn Snead became the first African American nun in the Order of the Discalced Carmelites in 1951. Miss Eva Bunting, a waitress who lived at the building in 1956.